Givenchy held a launch party and presented its Fall/Winter 2011 collection at Yeoksam-dong, Seoul on October 28, 2011. Celebrities were seen wearing frocks from Givenchy at the party, check it out! Kim Hye Soo (김혜수) opted for a black sheer dress from Fall/Winter 2011. Completing her look with a grommet blazer as cape and Christian Louboutin peep toe pumps. 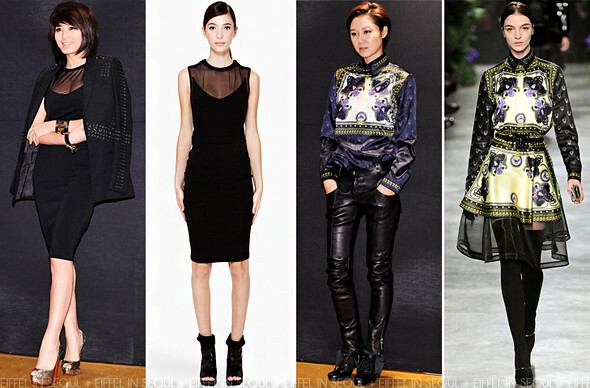 Gong Hyo Jin (공효진) was my best dressed at the event wearing a printed blouse from the Fall/Winter 2011 collection with a pair of leather pants and black boots. Androgyny at its best, her hair worked so well with it. Uhm Jung Hwa (엄정화) outfit was disappointing. As much as I love her blouse with the jacket, the pants are just not working for me. Don't even mention about her shoes. 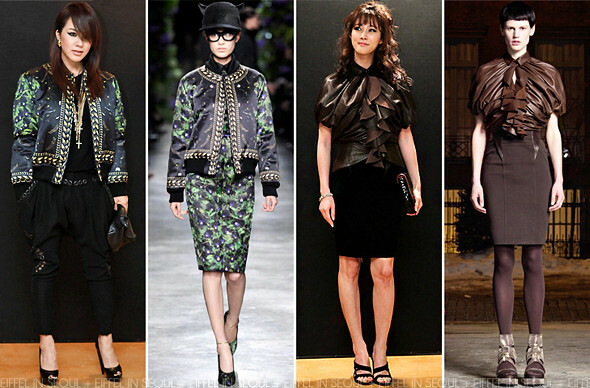 Lee Soo Kyung (이수경) was my worst dressed wearing a leather ruffled blouse from Pre Fall 2011. She opted for a black pencil skirt and sandals for her outfit, looking so much older than she should be! Someone tell this girl she needs a new hairstylist. Kim Min Hee (김민희)'s outfit came closely after Gong Hyo Jin (공효진)'s. A sheer blouse with panther print, laced-leather skirt was completed with a pair of black boots and the beautiful clutch from Fall/Winter 2011. Like Kim Hye Soo (김혜수), she chose to wear her outerwear as a cape. Jang Jae In (장재인) wore a runway look from Givenchy Fall/Winter 2011 menswear collection which is definitely too big for her. She looked like she was drowning in the outerwear but I appreciate that she chose to wear something from the men's collection. Yoo Ah In (유아인) opted for a Rottweilers-printed t-shirt, completed with a plaid-sleeved jacket which I absolutely love. He was my male favorite at the event. Lee Soo Hyuk (이수혁) kept it simple with a leather top, black denim and blue blazer. Givenchy's Fall/Winter 2011 consist of incredibly stunning prints and it was so disappointing to see how bland the stars were dressed for the event. Shop Givenchy on LUISAVIAROMA and SSENSE. I really think that Givenchy is the one this year you need to wear like the runway. It's really edgy, you can't make any mistake.